At The Golding Group, our mission is to provide our clients with practical solutions that solve their problem. Sometimes these solutions win awards for design, planning or measurement. Here are a few of our most recent accomplishments. The Golding Group goes 2 for 2 with projects for clients Rococo Restaurant & Fine Wine (Trade Show/Special Event) and CASA of Oklahoma County (Cause Marketing) plus a Judges Choice award. 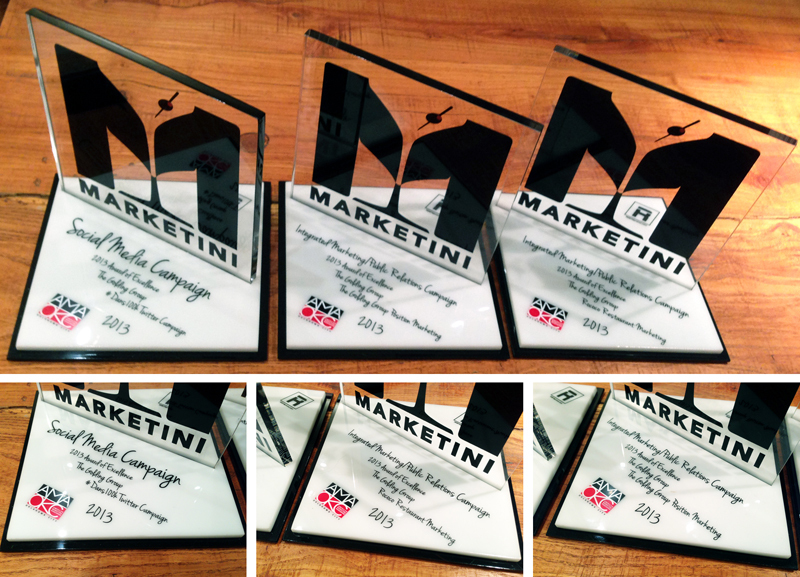 That make eleven total AMA-OKC Marketini awards in four years. The Golding Group goes 2 for 2 with projects for clients Rococo Restaurant & Fine Wine (‪#‎RococosCrabCakes‬ Contest) and Edmond Fine Arts Institute (website redesign with T&S Web Design). Both projects also won AMAOKC Awards as well (below). 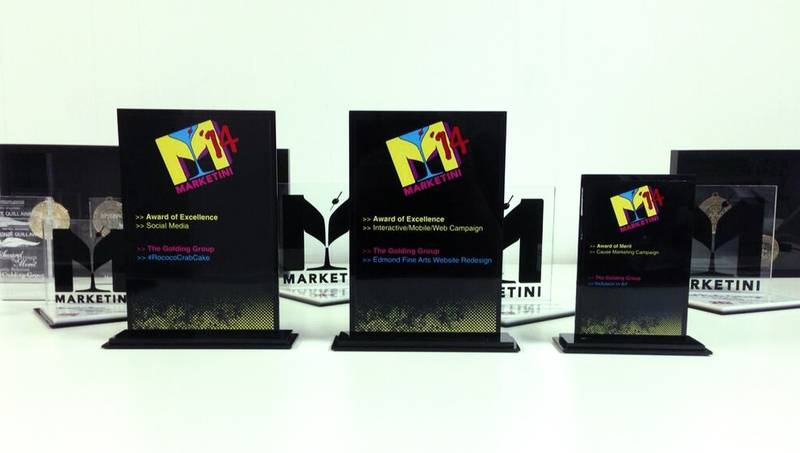 The Golding Group goes 3 for 3 in three different categories. Award of Excellence in Social Media for the Rococo Restaurants hashtag contest #RococoCrabCakes. Award of Excellence for the Edmond Fine Arts Institute website redesign with T&S Web Design in the Interactive/Web Campaign category. Award of Merit for Inclusion In Art branding in Cause Marketing Category. This is the second win in both Social Media and Cause Marketing for The Golding Group. 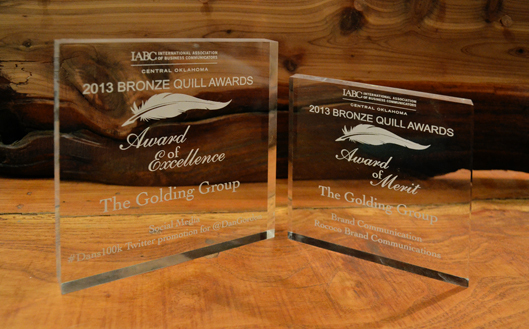 The Golding Group has won a total of 6 Bronze Quill Awards in two years. The Golding Group goes 3 for 3 in two different categories. We had a double Award of Excellence win in the Integrated Marketing category for our work with Rococo Restaurants and our own Golding Group campaigns for 2012. The third Award of Excellence came from #Dans100k Twitter Promotion we managed with Dan Gordon of Samuel Gordon Jewelers. The Golding Group wins two bronze medals at the 2013 ADDY awards. The Annual Report we created for the Mental Health Association of Central Oklahoma (MHACO) and the Samuel Gordon Jewelers / Tag Heuer Watches oversized banners won bronze ADDY awards for design/execution from the Oklahoma City Ad Club (AAF). Details. 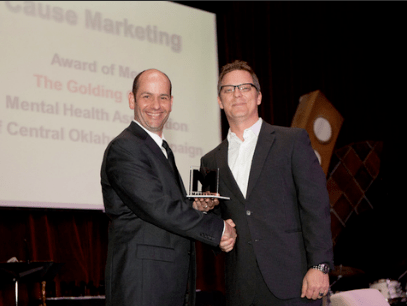 The Golding Group adds two new awards from the Oklahoma City Advertising Club with ADDY wins for projects for non-profit clients Mental Health Association of Central Oklahoma (MHACO). Silver Award for Broadcast/Electronic Ad, Mental Health Association Commercial, Bronze Award for Product Design.